Cryptocurrencies such as Bitcoin, SETLcoin, Ether, Solar Coin, or Liberty Reserve exist since 2009. Because of their decentralized control, they are often considered a threat or alternative to the conventional centralized banking system. While the technological implication of some such currencies, especially of Bitcoin, has attracted much attention, so far there is little discussion about the entire field of cryptocurrencies and very little academic literature addressing its ethical significance. 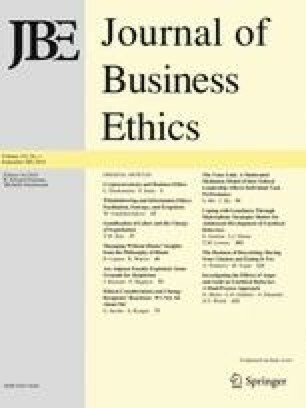 In this article, we thus address the impact of “blockchain technology” on the nature of financial transactions from a business ethics perspective. We begin with a survey on relevant literature from neighboring disciplines. Next, we work towards a 3 × 3 framework for current debates on the ethics of cryptocurrencies (see Table 1): we combine the micro, meso, and macro levels of business and society with assessments of the potential ethical impact of cryptocurrencies as morally beneficial, detrimental, and ambiguous. In addition, we highlight possible avenues for future research, such as the changing roles of the miners and regulators, the prosocial use of cryptocurrencies, the antisocial use for shadow banking and transactions in the ‘dark net’ and cryptocurrencies’ effect on inflation and deflation. The authors are grateful for the help of NN and NN (names omitted due to blind-review process) for extensive bibliographic research. Furthermore, they would like to thank NN and NN for reading and commenting on the original draft as well as the instructive feedback by two reviewers. Bajpai, P. (2016). Goldman Sachs files ‘SETLcoin’ patent: What it is and what it means. Retrieved May 16, 2009, from http://www.nasdaq.com/article/goldman-sachs-files-setlcoin-patent-what-it-is-and-what-it-means1-cm551600#ixzz489fFpTV6. Economist. (2016, May 2). Craig Steven Wright claims to be Satoshi Nakamoto. Is he? Economist. Retrieved May 16, 2003, from http://www.economist.com/news/briefings/21698061-craig-steven-wright-claims-be-satoshi-nakamoto-bitcoin. Graydon, C. (2014). Pump and dump: Know the signs when trading altcoins. Retrieved September 29, 2015, from https://www.cryptocoinsnews.com/pump-dump-know-signs-trading-altcoins/. HU (2015). Blockchain for good: Distributed ledger technologies and the CSR Agenda. Call for Paper Humbold University Berlin (HU). Retrieved June 16, 2005, from http://www.csr-hu-berlin.org/sites/default/files/CfP-special-session.pdf. Kaskaloglu, K. (2014). Near zero Bitcoin Transaction fees cannot last forever. In: The International conference on digital security and forensics (DigitalSec 2014), pp. 91–99. Retrieved August 19, 2015 from http://sdiwc.net/digital-library/near-zero-bitcoin-transaction-fees-cannot-last-forever.html. Kleineberg, K., & Helbing, D. (2016). A ‘social Bitcoin’ could sustain a democratic digital world (April 27, 2016). SSRN: http://ssrn.com/abstract=2771326. Krugman, P. (2013). Bitcoin is evil. In: New York Times Blog. Retrieved January 12, 2015, from http://krugman.blogs.nytimes.com/2013/12/28/bitcoin-is-evil/. Lee, T. B. (2011). Bitcoin prices plummet on hacked exchange. Ars Technica. Retrieved from http://arstechnica.com/tech-policy/2011/06/bitcoin-price-plummets-on-compromised-exchange/. McMillan, R. (2014). Bitcoin exchange Mt. Gox implodes amid allegations of $350 million hack. Wired. http://www.wired.com/2014/02/bitcoins-mt-gox-implodes-2/. Mik. (2015). Dubioser Konkurs: Tessiner bitminer pleite. Insite-It.ch. Retrieved May 16, 2010, from http://www.inside-it.ch/articles/40417. Popper, N. (2016, January 14). A Bitcoin believer’s crisis of faith. New York Times. Retrieved May 16, 2009 from http://www.nytimes.com/2016/01/17/business/dealbook/the-bitcoin-believer-who-gave-up.html?src=me&_r=1. Spiegel. (2016). Liberty reserve: 20 Jahre Haft für Gründer von Digitalwährung. Retrieved May 16, 2009, from http://www.spiegel.de/wirtschaft/liberty-reserve-gruender-arthur-budovsky-muss-ins-gefaengnis-a-1091233.html. Tendermint. (2014). The security of cryptocurrency protocols. Retrieved December 12, 2015, from http://tendermint.com/posts/security-of-cryptocurrency-protocols/. Wong, J. I. (2014). New study: Low Bitcoin transaction fees unsustainable. Retrieved August 2, 2015, from http://www.coindesk.com/new-study-low-bitcoin-transaction-fees-unsustainable/. Zander, T. (2014). Does anyone have anything at all signed by Satoshi’s PGP key? Retrieved October 12, 2015, from https://lists.linuxfoundation.org/pipermail/bitcoin-dev/2014-September/006621.html.